Get in touch with the team at CruiseAgency to book your next cruise holiday departing from Melbourne. We are Australia's leading online cruise travel agency, and offer discounted prices from all the leading cruise lines. During the 2019 cruise season, there are cruise departures from the port of Melbourne on offer from the following cruise lines: Princess Cruises, P&O Cruises Australia, Carnival Cruises, and Cunard Cruises. There are many short cruise options available departing from this port, ranging from 3 - 5 nights in length, taking in the beautiful sights and scenery of Australian destinations such as: Port Lincoln, Adelaide, Kangaroo Island, Sydney, Hobart, and Port Arthur ... just to name a few. For those seeking an overseas destination, there are a variety of longer duration cruises which take in the beautiful South Pacific islands and New Zealand. Often regarded as the jewel in Australia’s crown, Melbourne is certainly going to keep you more than occupied in the lead up to your cruise. As the city surpasses 5 million people, there is more to do and experience than ever before in the lead up to cruise from Melbourne. We’ll have a brief look at some of the best attractions in Melbourne below. Melbourne’s CBD is arguably home to Australia’s greatest shopping experience. There are some of the country's largest indoor and outdoor malls in Melbourne city, including the 6-storey Emporium and Bourke Street Mall. If you love to shop, then you’ll be right at home in Australia’s fashion capital. 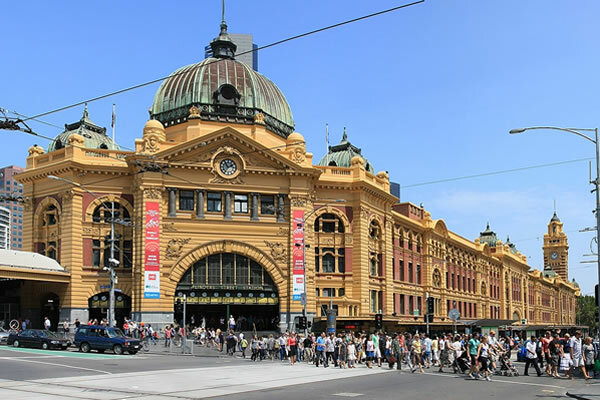 Taking a step back from larger shopping centres, Melbourne is also packed to the gills with plenty of small side-street boutique stores and upmarket shops for trinkets, clothes, souvenirs and more. For the best shopping experience, keep within Elizabeth and Russell Streets. Upmarket and designer clothing stores can be found on the far east of Collins Street - or the 'Paris End' of the CBD. Chances are you already know Melbourne for its unbeatable coffee culture, so taking a stroll in the CBD will leave you swamped with options. There are cafes left right and centre and we guarantee whichever you choose for a light snack and a coffee will be great! When it comes to food, Melbourne is, again, unbeatable. This time we’ll give you some direction though. If you want the best of the best for dinner, head down to Southbank - you can use the towering 300m high Eureka Tower as your guide to Southbank if you don’t know your way around. The entire Riverwalk is jam-packed with cafes, diners, eateries and upmarket restaurants that are sure to please even the fussiest of eaters. For casual snacks and lunchtimes, stick to Melbourne Central beneath the MeBank tower. Where Melbourne really shines is in the family activities department. This list could be endless, but we’ll try to keep it short. If you’re new to Melbourne, the 282m high Eureka Skydeck is a must, along with the Skydeck’s all-glass Edge Cube that extends over the city below. Once you’ve finished at the Skydeck, head out to the Melbourne Zoo in Parkville, just a few minutes away. If you’re in the mood to travel, shop and explore, why not check out Australia’s biggest shopping centre - Chadstone. Around half an hour by train or 20 minutes by car, Chadstone is definitely worth the trip. If you’d prefer to keep it in the city, there’s the SeaLife Aquarium, the Melbourne Museum (with dinosaur bones), the National Gallery, Queen Victoria Markets and so much more! Another category where Melbourne can’t be beat is in sporting tourism! If your cruise gives you a long enough stopover, you’ll be able to see where all of Australia’s biggest events happen. Head to Melbourne Park, just five minutes from the CBD, to find just about every stadium imaginable. Take in the MCG, Rod Laver Arena, AAMI Park, Melbourne Arena, Margaret Court Arena and the Richmond Football Club Museum. Just when you thought Melbourne couldn’t get more attraction-packed, we’re here to say Melbourne’s architecture is second to none. On the corner of Elizabeth and Victoria streets, you’ll find five residential towers so tall that they make up one of the tallest streets in the country. Pair this with the Eureka Tower, Shrine of Remembrance, the Royal Exhibition Building and Parliament House all within walking distance and you have one of the most architecturally diverse cities in the country. If you’ve not chosen a cruise yet and are considering cruises from Melbourne, then certainly take the plunge. Travelling to the city for a few days prior to your vessel departing will give you an insight into one of the country’s most majestic cities. If you’re lucky enough to take a cruise that returns to Melbourne, the city will truly be the cherry on top of an amazing Australian cruise.